Flint, Mich. - The Arizona Coyotes have signed Flint Firebirds' defenseman Dennis Busby to an Amateur Tryout Agreement (ATO) with their American Hockey League (AHL) affiliate, the Tucson Roadrunners. 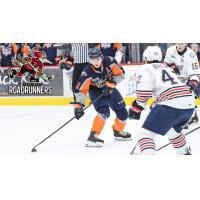 Busby has already joined the Roadrunners and will wear #11 with Tucson. Busby, 19, recorded a career-high 0.52 points-per-game this season. He tallied 14 points (1G, 13A) in a shortened season of just 27 games this year. The Barrie, Ont. native was selected by the Arizona Coyotes in the fifth-round (145th overall) of the 2018 NHL Draft after playing in just two games during his NHL Draft year. Busby is now the third Firebird to be called up to the professional ranks since Flint's season ended last Sunday, joining forward Ty Dellandrea (Texas Stars) and defenseman Hakon Nilsen (Wichita Thunder). Last season, Maurizio Colella (Worcester Railers) and Jalen Smereck (Tucson Roadrunners) were two Firebirds that earned professional bids. Prior to that, following the 2016-17 campaign, the Firebirds set a record of six players that signed contracts after a season: Nick Caamano (Texas Stars), Mathieu Henderson (South Carolina Stingrays), Connor Hicks (Adirondack Thunder), Ryan Moore (Orlando Polar Bears), Kole Sherwood (Cleveland Monsters) and Smereck (Tucson). The Tucson Roadrunners are the primary development affiliate of the NHL's Arizona Coyotes.